Hope you are all having a nice easy Sunday. It's the usual here. Mum has a lot of decisions to make with Granny regarding the house move and I hear them talking a lot about it. Mum, as usual, looks so worried and stressed so I'm here keeping her company, providing healing purrs, kitty kisses, and lots of laughs with crazy antics, like running and skidding across the floor on paper bags. I also take care of my lovely Granny as well as it's been stressful for her too and yesterday she had to have an operation to remove the cataract in her eye. Mum has to help her with eye drops and I just sit and stare when she does it. I am a very inquisitive feline and always need to be where the action is. I hear them discussing whether they should proceed with the house move. As it's a slow market, with buyers pulling out and being indecisive, etc, maybe it's best to stay put for a while. It may not be a nice area but the house is good and the neighbours are nice. Mum and Granny are just so tired of it all as it's taking a long time to find a buyer and when it looks like they have found one something goes wrong. And Mum and Gran haven't even found anywhere to move to yet because there are hardly any decent affordable properties coming to market in the area or areas they want to live. So maybe I won't be getting that catio anytime soon and Mum can't afford to build one for me here in case we do move in the future. If only Mum wins the lottery. She says if she does she'll buy a big house with a big enclosed garden for me and open a cattery for rescue cats. Nothing will make her happier. So glad you're taking care of mum & grand mum so well! What on earth would they do without you? Sending purrs and prayers to Mom and Grandmom. If the house is good and the neighbors are nice then maybe stay and wait till things turn about. Dad just was thinking of the same thing. 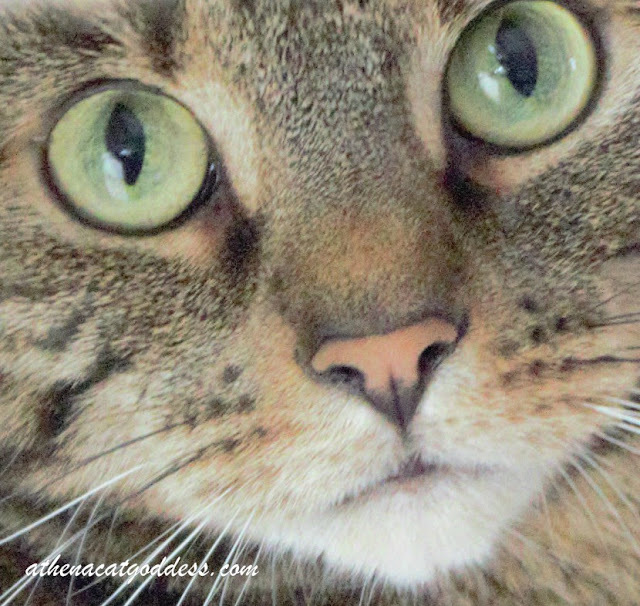 We love this close-up selfie of you, Athena. We are so sorry that the house move situation has been so stressful, and send purrs and prayers of peace to you all. And ones that Mum will win the lottery, too! That's too bad your human is having such a difficult time with the real estate market. At least you do have nice neighbors, even if you don't get to have a catio. Athena, you took a wonderful close-up selfie. Hopefully you have a nice screened window that you can enjoy in your current house - for as long as you're there. Purrayers and POTP for you, and your Mom & Grandma, sweet Athena ! Good luck to your family we are so glad that we can stay put where we are house hunting and selling is very stressful for humans. Athena, you look precious in that pose and picture. A lovable dear sweet little girl. Real estate stuff is nerve-wracking! Not sure what it's like in other parts of the globe, but in England it really is a nightmare trying to sell your home and move. I've come to believe that it just isn't meant to be for me to get away from London at this point in time. Too many personal problems to deal with too at the moment. Your comments always make me feel better, so thanks for the support! I don't know what I'd do without my cats. Between the love they give ... and the laughter they provoke ... I owe them my sanity. Sounds like you are the same in taking care of your Mum and her Mum!